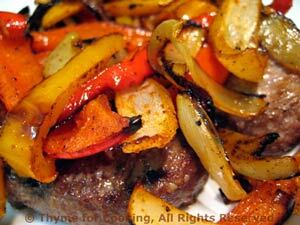 Grilled Burgers with Onion and Pepper, quick, fun and easy for summer grilling. Heat oil in a large nonstick skillet over medium heat. Add paprika and garlic powder and sauté 1 minute stirring constantly. Add pepper and onion and sauté until onion is transparent. Put peppers and onions in a large bowl. Add Worcestershire sauce, ketchup and beef to peppers/onions. Mix well and shape into 4 patties. Cook in an oiled grill basket or mat on the barbecue grill for 4 - 6 minutes per side, depending on how you like them done. OR sauté in skillet for the same amount of time, until done to your liking. Serve on buns if you like, we eat them without, with the Peppers and Onions. Slice peppers (cut in half from bottom toward stem, discard seed and core) into large slices - 1/2 inch wide (1.25cm). Put olive oil, paprika and Worcestershire in large bowl, add vegetables and toss well to coat. Put on a mesh grill pan (the idea is not to have the stuff fall through the grate into the fire....) and cook on the barbecue grill. OR sauté in nonstick skillet until tender and starting to brown. Either way they will take 10 - 15 minutes.